Not much blogging going on at the boat yard these days. Boats 1 & 2 have been out racing with my kids and they are loving it. We’re heading up to the Sabot Gold Cup at Newport Harbor this weekend with one of the boats. My son’s first “regatta road trip” and he is looking forward to it. 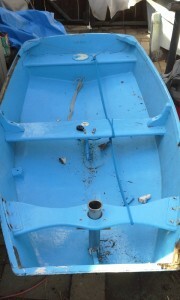 I’ve pulled another boat from the mold after making a few changes. The skeg is improved by not quite perfect (however the bumps are toward the stern where there is lots of turbulence anyway) but I’m quite happy with the mid-thwart and leeboard changes. I’ve placed it back in the mold while I’m working on a fix – or rather complete refab – of an old-old sabot. It had considerable dry rot on the rails and thwarts and the more we dig the more we continue to find! It should be completed this week so I can get back to the new boat.